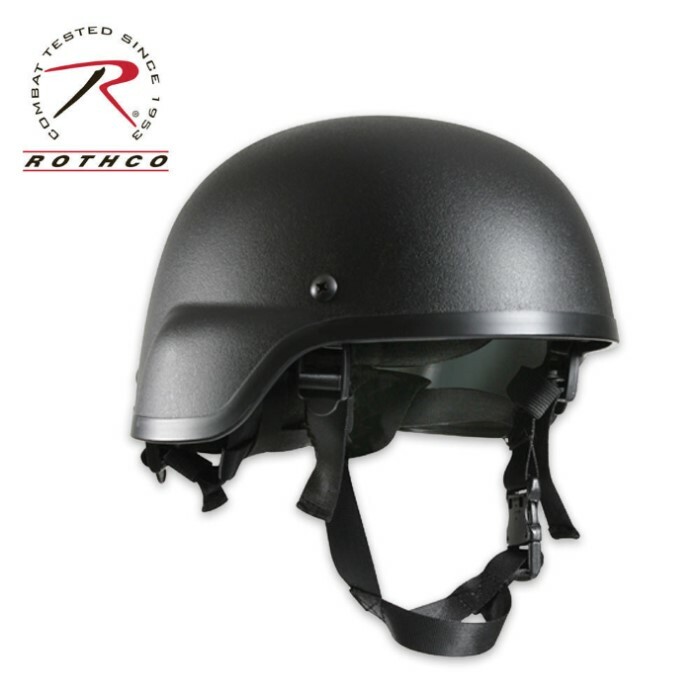 One size fits 6 3/4" to 7 3/4"
This military-style plastic ABS composite helmet features seven removable/adjustable cushioned pads for a custom, secure fit with maximum comfort for the wearer. The hook and loop strips make it easy to attach pads, and the adjustable nylon chin straps have plastic buckles to hold the helmet firmly in place. This tactical helmet is black for a realistic, covert look and feel, and it's great for a variety of purposes: paintball, airsoft, reenactments, costumes, etc. I was impressed with this product. I origonally bought it for airsofting after i decided i had been shot in the skull to many times. Yesterday i want airsofting at my local field and this helmet was extremely effective. The only problem i found was that the straps do not adjust correctly to those with smaller heads because the only place to adjust the straps was at the base of the helmet. When you adjust it all the way the straps are pulling up on your ears uncomfortably. This was not a problem because if you wear something that covers your ears the strap will not bother you. Keep in mind that this helmet is not a protective helmet such as a construction helmet, it is only for look, airsoft or paintball. Other than the strap issue this helmet is very comfortable. I would definantly recommend this to other people. If you aisoft make sure to purchase this product.